It seems, these days, it is not enough to have a linear cinematic plot, with characters, dialogue and action. The world around us has become unsatisfactory and therefore it has come to us to change the very face of nature. First came the inexplicable evil of Jaws. Then came the zoologically twisted Sharktopus. Now, finally, we have the nature-defying Sharknado. Staying out of the water won’t help you. The sharks are coming to you. Fit to bursting with crazy, apocalyptic weather, propelling sea monsters and inexplicably roaring sharks, the film is so insanely unpredictable that it just might be true. Initially made for television, the film proved to be such a cult hit that it has enjoyed a cinematic release. Not only that but the film’s sequel has recently been released, too. If there’s anything better than sharks and tornadoes then surely it’s sharks and tornadoes made bigger. Scoring the first film was Ramin Kousha, who spoke of the importance of musical texture of melody in his composition. Much like the cinematic content, it seems that scale and shock won over linear musicality and development. Composing for the second film, Christopher Ridenhour and Christopher Cano chose to stick to more classical cinematic themes: “the director wanted a classic score with traditional themes and big epic action moments”. The scoring of both films is directly opposed and it seems that the only way to determine a winner is to understand the workings of each composition. 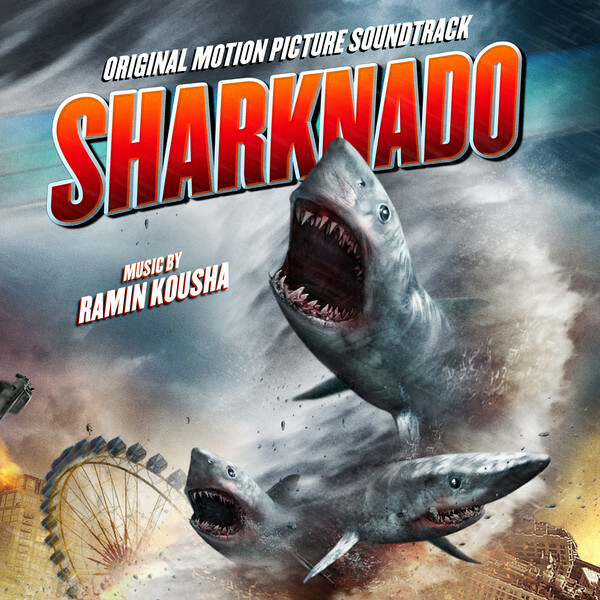 From the opening self-titled cue of Sharknado, it’s clear that the music has been made for purposes of cinematic action, not musical longevity. Driven by frenetic strings, drawling, groaning bass and slamming drums, the cue fares exactly how you expect it would. Whilst somewhat effective in the moment in which it is played, it fails to make any lasting impression upon the memory, dying away as the sharks inevitably will in the end. Cue ‘Storm’s Dying Down’ begins a little more promisingly, driven by electronic drones and plucked percussive noises. Soon, however, things take a turn for the expected. Tremolo strings open into a passage punctuated by claps of brass and violent, screeching strings. Of course, it is in the quieter moments that the music is at its most interesting; in the quiet of the storm, the moment is at its most perilous. Inevitably, Kousha is too impatient to extend the uneasiness of the quiet, moving as he does into louder musical fare. Kousha’s score continues in a similar vein; sounds piled upon sounds with apparently little thought behind them. Moving from one musical idea to the other, there is no coherence within the tracks. And despite this, it is very difficult to perceive how moments within the music differ from the others. Using the tried and tested package of building strings, deep brass and distorted electric guitar, Kousha’s music sounds like an unremarkable wall of noise. Even in moments of apparent melodic development, such as towards the end of cue ‘Sharks, I Never Saw That Coming’, the musical fails to leave a mark. From time to time, there are moments of greater interest, made all the more infuriating by the rest of the disposable score. The opening of ‘I Never Saw THAT Coming’, for example, is genuinely lovely. Building from gentle chord structures, the sounds develop and expand gradually, leaving a much greater sense of satisfaction. It is clear in moments such as these that Kousha is a genuinely sensitive composer; if only he could harbour it a little more throughout the soundtrack.